Irish cake server features a pewter handle with an embossed Claddagh icon; it would complement any wedding celebration. This Irish wedding cake server complements the Claddagh cake knife. This Claddagh wedding cake server features the famous Irish symbol embossed on the pewter handle along with a stainless steel blade. 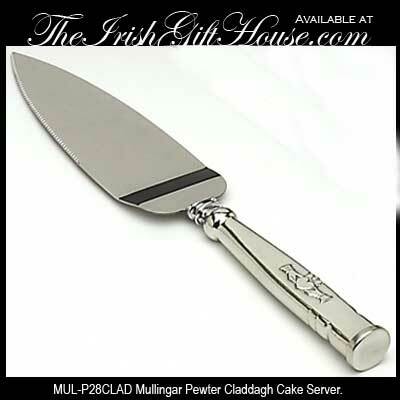 The Claddagh cake server measures 10 1/2" long and it is made in Ireland by Mullingar Pewter. The Irish wedding cake server is gift boxed with a Claddagh history card, complements of The Irish Gift House. Irish cake knife features a pewter handle with an embossed Claddagh icon; it would complement any wedding celebration.